Surely, chocolate is the work of the devil, since a taste so divine is too good for us mortal and sinful human beings. I can go a day without chocolate, but I do not like to. I figure as long as I am abstaining from so many of life’s other vices, such as whoring, drunkenness, gluttony, smoking, snorting cocaine and voting Republican I am entitled to one modest little sin: chocolate. Were I a good Catholic I would feel obliged to report my sinful behavior to my priest because frankly, there is not much else to report. I would have to hope that penance did not consist of a week of chocolate withdrawal. All I can say is that for this lapsed Catholic of more than thirty years, all the Pope has to do is require priests to distribute chocolate communion wafers and I’d go back to Mother Church in a heartbeat. I’d be humming “Nearer my God to Thee” on my way to the communion rail. Chocolate, like most things American, has become cheapened and bastardized. I came to this realization this week here in Denver. A few times a week to satisfy my chocolate craving, I have been discreetly dropping in on the snack bar where I work. There I engaged in my sinful 240-calorie habit: a bag of Dark Chocolate M&Ms. This week though because I am on business travel I have not been able to satisfy my Dark Chocolate M&Ms Addiction. None of the vending machines carried it. So yesterday, I thought I would try those old fashioned M&Ms. You know, the ones so loaded with sugar the chocolate is almost ancillary. What a mistake! Regular M&Ms, once my ideal way to satisfy a sudden chocolate craving, became nearly inedible. Had it really this sweet all along? How could I have ever eaten this stuff? Dark Chocolate M&Ms indicated to me that I had been selling myself short all these years. The Dark Chocolate M&Ms at eight five cents were the exact same price and size as the regular M&Ms. However, the dark chocolate M&Ms were 1000% tastier. People on the continent have understood for centuries that dark chocolate is the real chocolate. The overly sweetened stuff served to us in our candy bars is more sugar than it is chocolate. In short, it is inferior. For years, I ate the sweetened applesauces. Then one day I tried the unsweetened version and discovered that I could actually taste the apples. I never went back. That is the way it now must be with chocolate. Chocolate is too rich an experience to cheapen it by loading it with excessive sweeteners. The real prize is the chocolate flavor itself. Admittedly, real unadulterated chocolate such as used in baking is inedible to most of us. However, by sweetening chocolate just a bit, so it is semi-sweetened, you can appreciate chocolate without having to deal with its bitter natural taste. Allegedly, dark chocolate is something of a health food. Like any candy, it should be consumed in extreme moderation. Nevertheless, I feel better knowing that consumed in moderation it may have a few health benefits. It can lower blood pressure. Since I do not have a blood pressure problem, this is probably not a reason to consume it. Yet it can also be an antioxidant, providing it was manufactured without milk. What is dark chocolate’s secret? It is something called cocoa phenols, which is a compound known to lower blood pressure. As best as I can tell, Dark Chocolate M&Ms do not have any dairy products mixed with them. However, even if it had no health benefits, it does not matter. It is by far the best brand of M&Ms on the market. It is inspiring me to try a host of other dark chocolates, both foreign and domestic. With less sugar in it than regular M&Ms, it is also less likely that I will feel the need to consume more chocolate. Whatever. 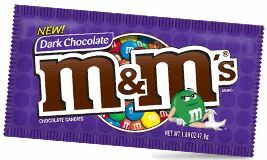 I predict that within a few years Dark Chocolate M&Ms will overtake regular M&Ms in overall sales. America will discover that it prefers the chocolate to the sweeteners and the added milk. It is amazing how much more endurable my life has become because I indulge in a few small bags of Dark Chocolate M&Ms over the course of a week. I have discovered I can endure a lot of crap in my life for the compensation of the taste of this ambrosia. Lord, I am not worthy to receive this elixir, but if you cut down all our chocolate trees, I’ll come after your head. Can I kick the DailyKos habit?